When you have long hair, making sure that all of your stray strands are cleaned up can be a trivial task. When you use the right vacuum cleaner, it can make all the difference. That’s why we’ve compiled a list of the best vacuums for use with long hair that we could find. This way, you can make an informed decision about your vacuum cleaning needs. Here are some things you should know. Type: A traditional vacuum is called an ‘upright’ vacuum. Other variations on this model include the stick vacuum, which is smaller and easier to maneuver. Canister vacuums hold a lot of dirt, and robotic vacuums do the work for you! 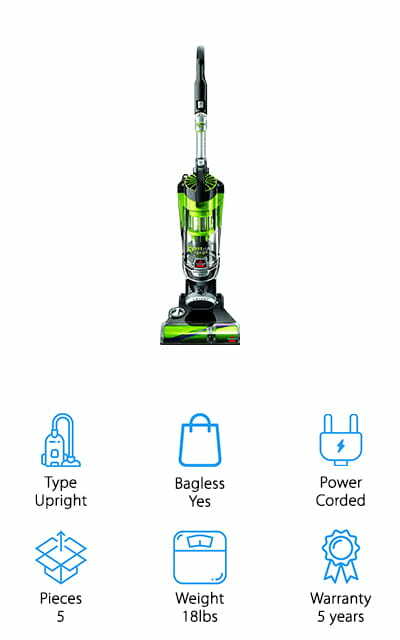 Bagless: Most of the vacuum cleaners on this list are going to be bagless. They use a dirt cup to trap all of the things you don’t want in your carpet instead of storing it in a bag. Power: What type of power does the vacuum run on? There is a good mix of corded and cordless vacuums here; cordless is more portable and typically less powerful than corded vacuums are, so choose wisely. Pieces: How many pieces come with the set? This will include charging stands and any applicable accessories that come with the vacuum cleaner in the box. It’s important to know what you’re getting for your money. Weight: How much does the vacuum weigh? For handhelds and other portable vacuums, this is an important factor because you’ll be carrying the vacuum around with you. Otherwise, a lighter vacuum is easier to push around the house. Warranty: A warranty is a guarantee that the company stands behind their product. If it breaks during normal use during this time period, you can get a refund or a replacement vacuum without too much hassle. Now we can show you these amazing vacuums! When you have long hair, you’re going to want a vacuum that can handle it. Our top pick and budget pick are the best of the best, so check them out before moving on to the rest. We’ve done our research to make sure that you get the best selection of vacuums that can be used for long hair, so make sure you read on until the end! Our choice for the absolute best vacuum you can have if you or your pets have longer hair is the Dyson V8 Stick vacuum. This is one of the only stick vacuums on our list. Usually, they aren’t made with the same suction rating as some other vacuums. However, this one stands up to the challenge. 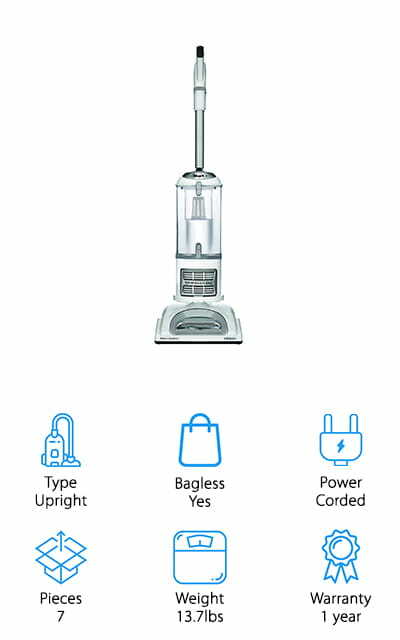 In MAX mode, it can stand up to the suction power of any upright or canister vacuum easily. It uses a trigger system to make sure that it’s only running while you clean so that you can get the most out of the battery life. It comes with a soft-roller hardwood cleaner head, as well as a direct drive cleaner head that will help get all of the deep dirt and hair out of your carpet. Top it all off with a HEPA filtration system and cyclonic suction technology and you truly have a beast of a vacuum cleaner. The Bissel Pet Hair Eraser is a pet vacuum that doubles as a vacuum for long hair as well. This is because of the excellent suction that it delivers. Most handheld or cordless vacuums don’t pack as much power as this one, which means they won’t get all the hair out of your carpets and upholstery. That isn’t the case with the Bissell Pet Hair Eraser, which works with a multi-level filtration system to make sure that all of the dust, dirt, and allergens are being taken out of your air before it’s cycled out of the vacuum again. You can use it in the car or on your stairs to get the most out of its cleaning capabilities, and there are even two different nozzles to use. The specialized rubber nozzle helps to attract hair and pull it out of even the deepest areas of your carpets and upholstery. 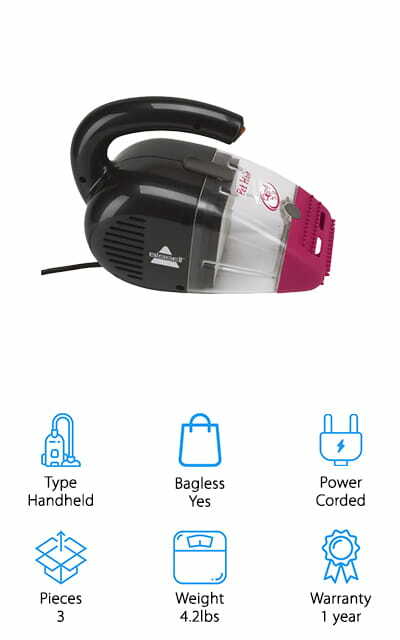 This corded vac delivers consistent power! Shark’s Navigator Lift-Away is an upright vacuum that can turn easily into a canister vacuum with the press of a button. It has anti-allergen seal technology, which means that it traps dust, dirt, and other allergens deep in the filter and doesn’t let them back out into your air. This works with the HEPA filter to keep your air and your floors clean. This lightweight vacuum is easy to use, with a simple portable function that you’re going to love for cleaning the rest of your home. It comes with a brush roll shut-off button that will deep clean the carpet and gently scrub your bare floors for a polished look. The fact that you can shut the brush roll off makes this vacuum good for long hair, that way it isn’t tangling in the bristles themselves. This makes it easy to clean and great for your hard floors and carpets. We love the power behind this vacuum! Eureka’s Airspeed Pet Vacuum can grab long pet hairs as well as long human hairs with ease! It uses an air-powered technology that gets more air moving, creating more suction and dirt for a deeper clean of all of your upholstery. The dust cup is washable and reusable so you don’t have to bother with replacing bags when you clean. Eureka has a neat feature that means its vacuums never lose suction, maintaining the same power over the life of the vacuum. This vacuum also has five different height adjustment settings, as well as a stair and upholstery turbo nozzle to help get those areas super clean. The allergen filter keeps your air cleaner after you vacuum as well. One of the coolest things about this vacuum is the automatic cord rewinding system. 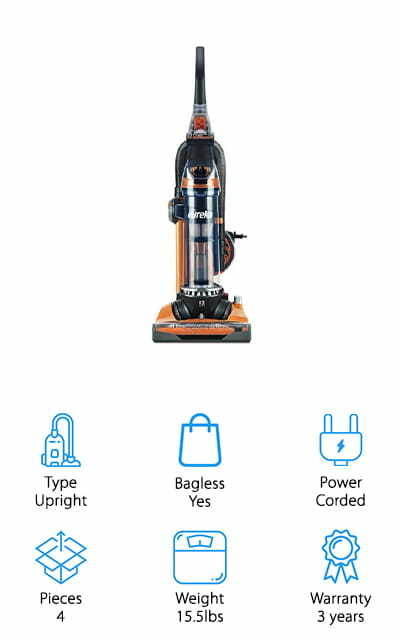 At the push of the button, the vacuum will store the 27-feet of cord for you so you don’t have to bother with winding it. Hoover makes a great vacuum cleaner for long hair, just as they make a great vacuum for any other occasion. This upright, corded vacuum is only about 18.7 pounds, making pushing it around and using it fairly easy for just about everyone. You can adjust the height with five different positions for different styles of carpet and hardwood. The cord is a full 25-feet long and has a rewind function that retracts the cord when you gently tap the pedal. This way it doesn’t get tangled and you don’t have to wind it. It comes with an air-powered Pet Hand Tool to grab pet hair out of floors, and that works equally well with long human hairs as well. The pet upholstery tool is great for cleaning your other furniture, and you can use the crevice tool for tight spots and the extension wand to get to hard-to-reach spaces or any cleaning location above the ground. Bissell’s 1650A Pet Hair model Is one of the best vacuums for hair removal that we found during our research. It’s an upright vacuum with plenty of attachments for the hose, including a 2-in-1 pet brush and TurboEraser tool to get all of the dirt, dust, and hair up. What makes this vacuum particularly great for long hair is the tangle-free brush roll that will keep your long hairs from getting tangled up while you clean. It has swivel steering so that you can get into those tight spaces, helped along by edge-to-edge technology that allows you to clean the entire space of your home. 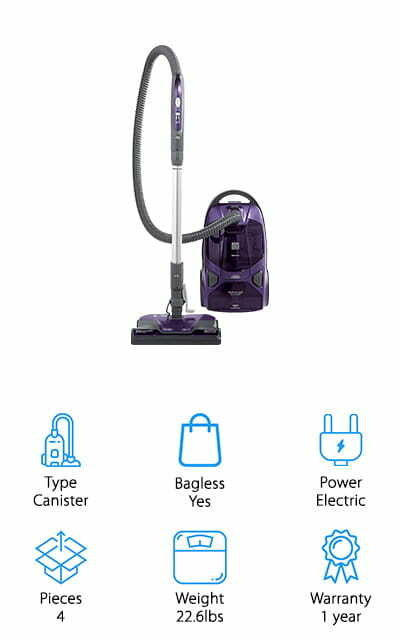 With everything that comes with it, including a 30-foot cord and five different surface height settings, you’re going to get an amazing vacuuming experience. Your floors will thank you! It even has an 8-foot hose for all of the hard-to-reach surfaces, like the ceiling fan and the space above the cabinets! Kenmore makes this vacuum for long hair and hardwood floors that can work to clean your entire home, regardless of the floor or surface you’re working with. There are two different floor nozzles included; one for use on hardwood floors and carpets, as well as a bare floor brush system that polishes and cleans at the same time so that all of your bare floors will look great. It comes with a motorized pet hair brush so that you can get hairs up off of your upholstery, which is also helpful for long hairs as well. The wand on the canister telescopes out so you can get into all of those tight spaces, as well as high and low. The HEPA filter needs to be replaced every six months, so it’s going to save you some change as well. Though it is a corded canister, it’s got a full 28 feet of cord length so you can clean everywhere! It’s no surprise that Shark makes one of the best vacuum cleaners for long hair on our list. They have a vacuum for pretty much any occasion! 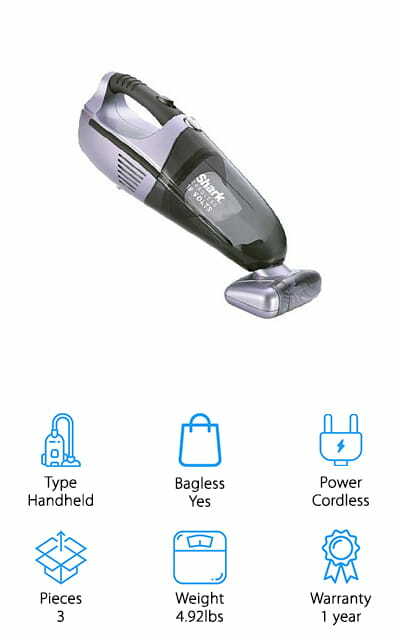 This powerful cordless vacuum is great for dragging throughout the house as you clean all of your surfaces. No dust will be left behind when this powerful hand vac is on the case. The Twister Cyclonic Technology gives you the strongest suction that you can expect to get from a hand vacuum. This thing will surprise you! It comes with a large motorized pet brush that is probably your best tool for removing long hairs from your surfaces. Its extra-large size gives you a wider coverage area as well. The charging stand can be mounted onto a wall for easy storage, and so you can grab it when you need it. 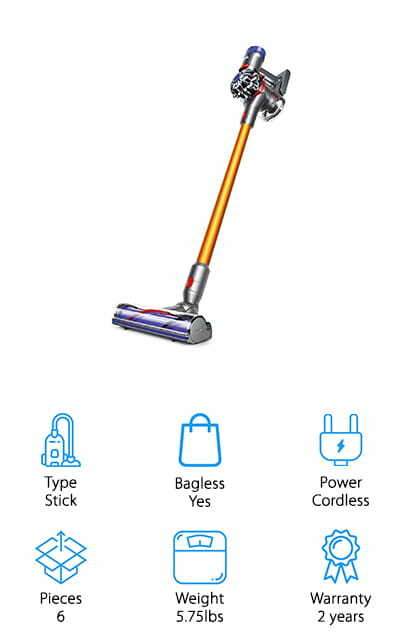 For a cordless vacuum, this thing will run forever without needing a charge. We think that’s pretty amazing. When you’ve got long hair, sometimes cleaning up all of the hair you leave behind can be a chore. That’s why you should call on the ILIFE V3s pro Robotic Vacuum instead of dealing with it yourself. This robotic vacuum focuses specifically on picking up hair, debris, and dirt all in one go. It can clean under beds and around furniture due to its furniture-sensing technology. You can set a cleaning schedule, and when it needs to charge it just goes back to the dock to charge again. All you have to do is clean the dustbin out and clear the filter between uses. You can use it on hardwood floors, and it works even better on pet hair than a regular robotic vacuum. 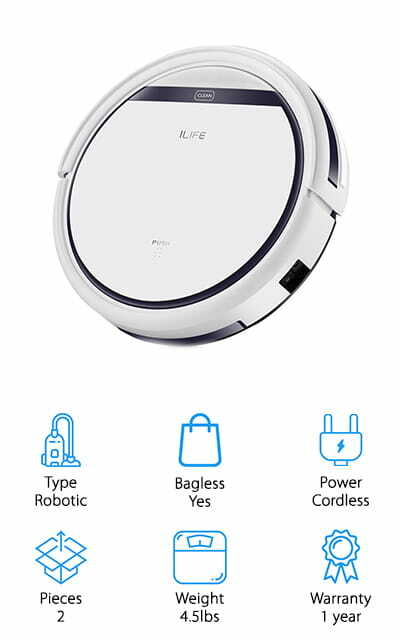 If you want something that’s going to clean up for you and your pet, go with the best robot vacuum for long hair that we found during our research. We love the automatic clean! 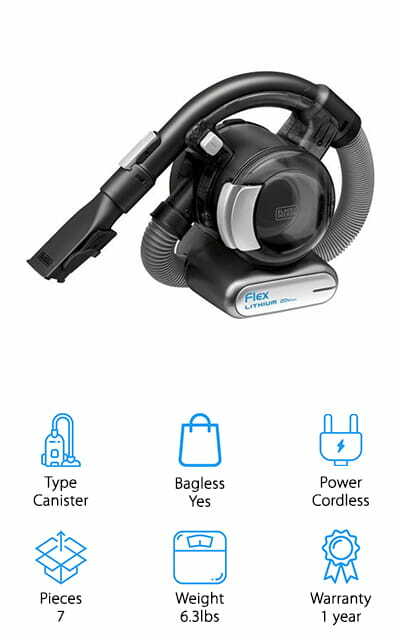 The BLACK+DECKER MAX flex is an ultra-compact canister vacuum that can easily get into all of the nooks and crannies where longer hairs hide. It’s a cordless and extremely portable vacuum that’s going to make cleaning the whole house a breeze! It has a stick vacuum floor head attachment for when you need to get larger cleaning jobs done. And even then, this thing is going to work like a champ due to the cyclonic suction action that keeps dirt where you want it – in the vacuum, and off of your floors. It only takes about four hours to charge to get a complete clean out of it. It includes a 4-foot flexible hose that you can use to get to those higher places or into the back corners behind couches and other furniture. The charging base also serves as an organizer to keep the pet hair brush, nozzle/brush tool, crevice tool, and other attachments organized.